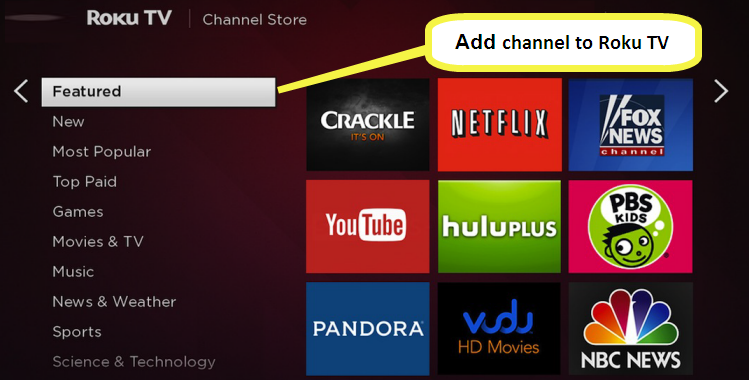 Want to add new channels to your Roku Streaming Device? This can be done just like you add a new app on your Smartphone. Every Roku Player having access to Roku Channel Store in a way to add new channels to your Roku TV. Some of the Roku channels need a paid subscription and some are available at free of cost. To access free channels you can directly access them from Roku Channel Store on your Roku Streaming device. You will see several channels categories – News, Movies, Music, Family and many more which you can add. Beside this you can search for any specific channel by searching with its name. When the channel page one press “Add Channel” and it will get installed and added to your Roku TV Home Menu. You can even add app to your Roku TV via Roku Mobile App. For this you need to install Roku App on your Smartphone. Open App and sign in with you Roku account details. Roku App must be linked with your Streaming Devices. In a way to add channels click on “Channel Store” at the top right corner of the screen. If you want to add Non-certified, Secret or Private Channels to your Roku Streaming device then you can also do that. As this category of channels is not listed under channels on Roku Channel Store, this can be done with a special code to activate channels. There are huge numbers of private and non-certified channels which you can add. After that click on “Add Channel”, you will get a warning message. Kindly accept that and click on “OK” to proceed further with installation. All done! Now it may take upto 24 hrs to appear added channels on your Roku device.